A comprehensive list of Photomyne's Photo Scanner app features and all the great things you can do with the app. Scan entire photo album pages or batches of up to 4 photos in one shot. Scan an entire album, page after page, in minutes. See the magic of auto-cropping and color correction of scanned photos. Easily add descriptions to albums, add names, location, dates & date ranges. Add photos to an existing album (from additional scans). 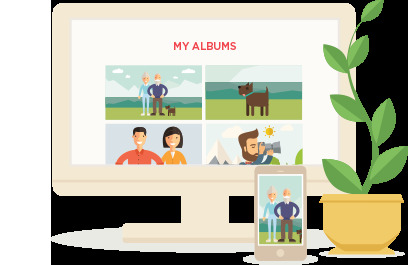 Cloud backup: Unlimited photo backup of cropped photos + original scans. Web access: Access your photos online through photomyne.com from your personal computer or any device with internet access. Account sync on multiple devices: Access your Photomyne account and photos on other iOS + Android devices. Cloud-only backup - Free up space on your device: If you have lots of photos taking up your device's memory, this option frees up space on your device while keeping photos backed-up on the cloud. Photomyne's subscription account is a recurring annual plan, and you can cancel it anytime. Share photos via email, Facebook, text message and other messaging apps available on your device: if up to 2 photos, recipients will receive actual photo files (JPG). If sharing 3 or more photos, recipients get a private share web link they can then view in their browser on any device. Share selected photos or all photos in an album. Peep into rare real-life memories of Photomyners from around the world (published photos Photomyne users actively decided to share). Choose to share your photos with the Photomyne community and see them on your Discover feed. Filter your Discover search based on location and themes (coming soon). The Discover feed is coming real soon to the Android app as well.